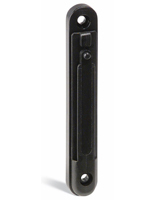 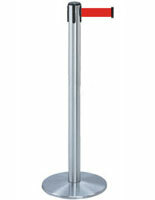 These chrome stanchions with gray belt are made of metal with a contemporary satin finish. 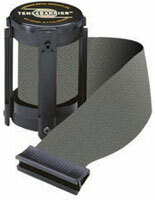 The floor standing posts come with a 13' long retractable strap that can be used to control traffic and form service lines. 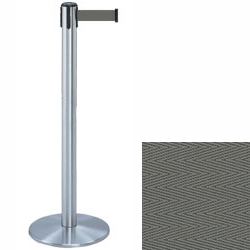 In addition, the chrome stanchions' durable metal fabrication and sturdy weighted base makes them ideal for high traffic environments. 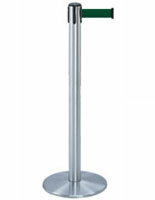 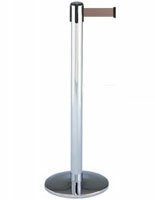 The floor stands have a 4-way adapter and a flat top that can be used to fit compatible signs and other accessories. 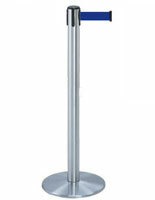 The retractable tape stanchions are excellent for directing traffic in a variety of settings including hotels, movie theaters and service organizations.